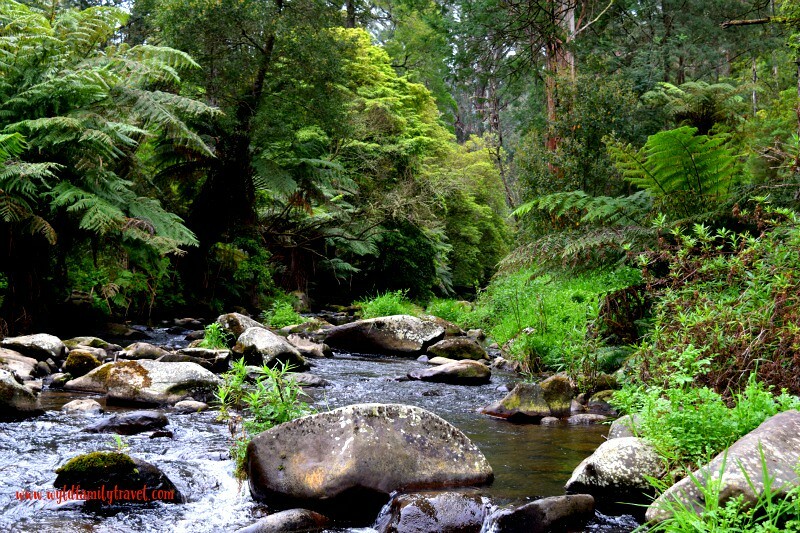 Tarra Bulga National Park is located in the South Gippsland region of Victoria in Australia. Located 200 kilometres east of Melbourne. Turning off at Traralgon you head into the Strzelecki Rangers. Roads throughout this area are narrow and winding but offer some fantastic panoramic views of the mountains and forest areas. 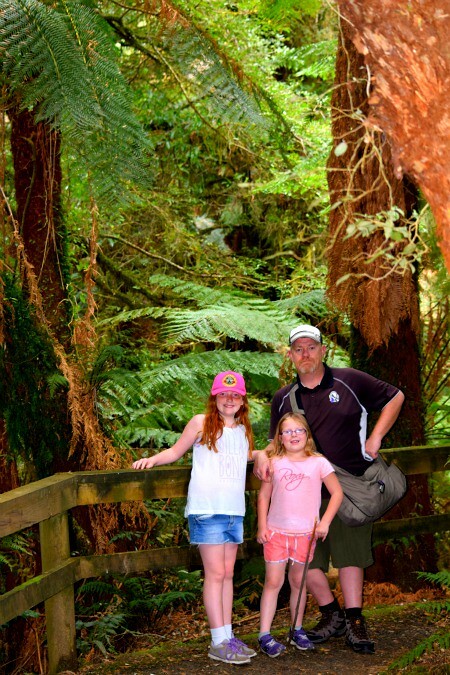 Having fun at the Tarra Bulga National Park visitors centre. 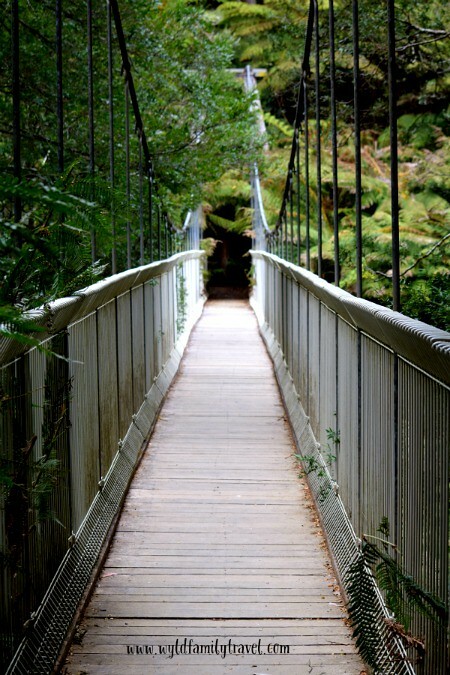 Tarra Bulga is a jointly managed national park in Gippsland. The land where the park is located was once the land of the native aboriginal Gunaikurnai people. Parks Victoria and the Gunaikurnai people oversee the care and maintenance of the park which recognises that the Gunaikurnai are connected to the land and speak for the land. We packed the cooler with bbq food, sausages, steak, hash browns and some salads. Tarra Bulga Visitors Centre has an information centre that displays pictures and information about the different flora and fauna that is located in the park. The visitors centre was a big hit with Willow and Marley. Inside the centre was a colouring table set up with pencils and pictures of the native animals to colour in. Possums, wallabies, emu were decorated with multi colors by Marley. I have never seen a rainbow striped Kangaroo before, but it would certainly be a sight running through the Australian bush. The visitors center is located amongst the giant mountain ash tree’s just off the road with BBQ’s and picnic tables scattered throughout. We set ourselves up and laid out the picnic blanket on the table and fired up the BBQ. The steak was sizzling and the sausages were frying. We were joined by a bright red Rosella bird who was happy to walk around our feet under the table looking for scraps of food. The girls took some bread and slowly sat down on the grass to entice this colorful bird to eat out of their hands. Willow and Marley’s eyes lit up as the little bird approached and cautiously ate some scraps of bread out of their hands. A loud noise frightened the bird off and we sat down to eat our BBQ lunch. When packing up under the blanket on the table was a sign saying do not feed the birds!. Oops, a bad parenting moment for the day! 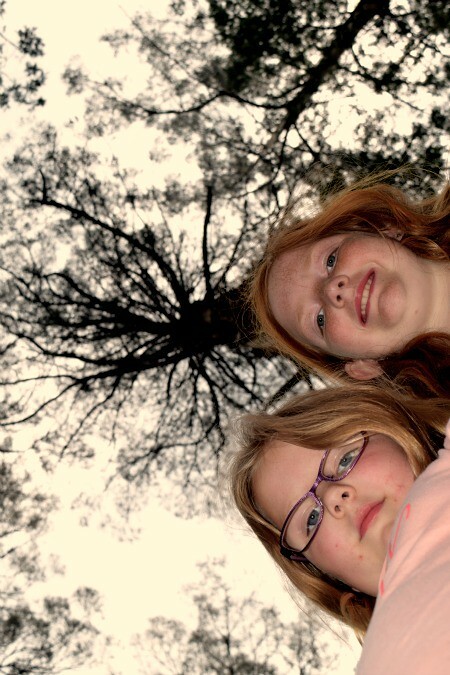 We decided that we would go for a bush walk. There are numerous walks that can be taken from the visitors center. 4.4 kilometers. This track is for a more serious hike with some steep sections that run through the forest and contain sections that cross the roads. It makes its way the mountain ash section and the unusual section of hazel pomaderis. We chose to walk to the magnificent Corrigan’s Bridge. The walk to the bridge is slightly down the hill through a canopy of mountain ash trees that are hundred’s of years old, with their huge trunks and ferns as high as double story houses. The girls loved the walk down looking out for animals and reading the information signs that are placed along the walk. 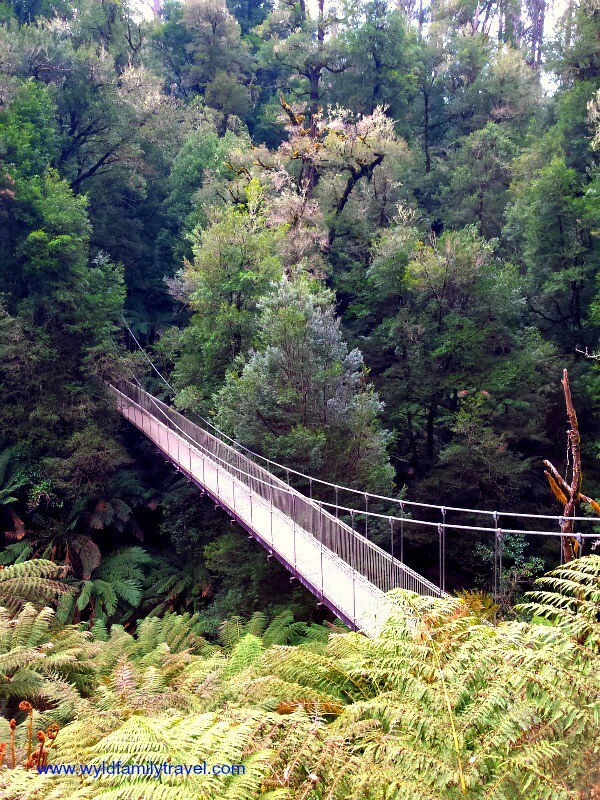 Corrigan’s Bridge is an amazing sight as it comes into view seemingly floating in mid air amongst the forest. The walk back out from Corrigan’s bridge takes you through Fern Gully where giant ferns surround you in all directions and small streams flow through valley floor seemingly emerging from nowhere. Our girls were not so keen on the walk back, like all things when you walk downhill one way you must walk up the hill another way. Our youngest daughter Marley is not one to hide her feelings (she gets that from her mother) and in no uncertain terms let us know what she thought about walking up the hill. 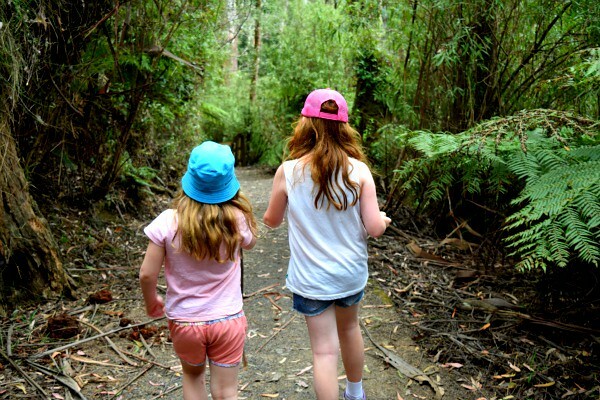 A walk in Tarra Bulga is like being transformed to another time it brings out the explorer in all of us as you wind your way through the tracks with mountains of forest on either side of you. The peace and tranquillity is amazing, you feel like you are the only people alive with just the background soundtrack of birds and animals making their noises ringing in your ears. It is a great escape from the modernization and industrial world that we live in today with its hustle and bustle of life that we experience every day. Once back to the car we headed down the road to view the Tarra Falls Waterfall. The Tarra Falls only a small waterfall 12 kilometres away in the Tarra Valley. The viewing platform is only 20 meters off the road. This made Marley happy for sure no more hills to walk up. Tarra Falls would not rate greatly against many waterfalls, no big drop of water falling over a cliff here just water rushing down an elongated surface of a rock. There are 2 caravan and camping parks located in the Tarra Valley along with a handful of guesthouses. We are hoping to go back there camping one day soon. One of the camping parks looks excellent with sites situated on the banks of the Tarra River. 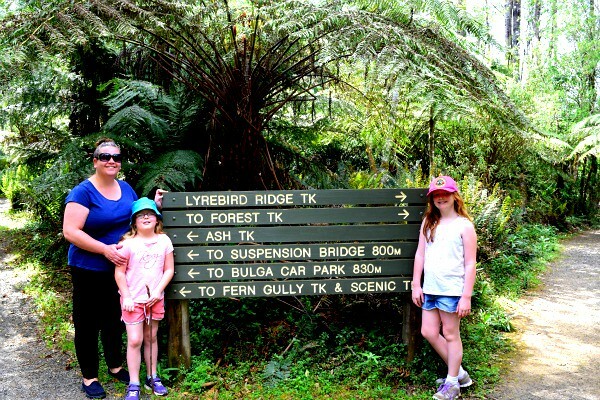 We highly recommend Tarra Bulga National Park for a nice easy day trip out getting back to nature is a great way to spend a day. Thanks for commenting Marta we appreciate it. Thanks for commenting Meg we appreciate it.